Advocate Non-Contact Infrared Thermometer reads body temperature in seconds without touching skin. Simply hold it within 2”–4” of the forehead for an accurate readout at the push of a button. Ideal for hygienically monitoring without disturbing rest, it allows you to store and retrieve the 12 most recent readings. Also measures ambient temperature, allowing you to monitor a room’s temperature. 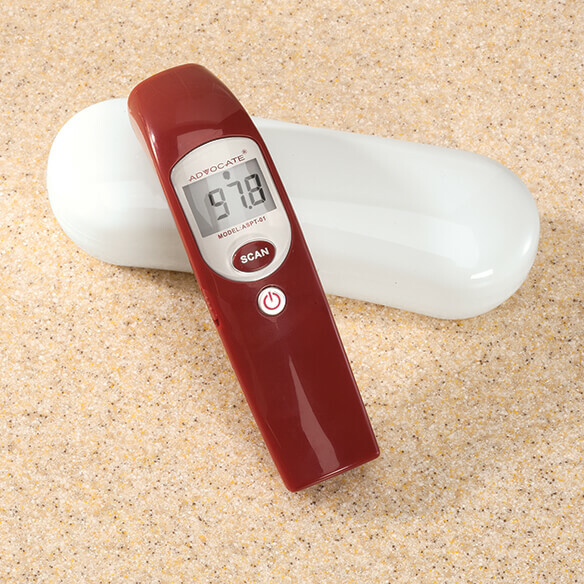 The large, easy-to-read LCD with fever notification displays Fahrenheit or Celsius and shuts off automatically. Choose from silent display or talking mode in English or Spanish. tired of waiting and when some else needs it you have to sterile it.